Although the Asus N73J is a well built media centre, it doesn't quite hold up to the other big-screen laptops. Build quality is excellent, with a strong metallic finish to the firm chassis that is immune to scuff marks. We liked the design, although the 3.7kg weight might be a bit much for some. Portability is further impaired by the 103-minute battery – one of the worst results we have seen in a while. The built-in Blu-ray drive can be used to watch films and create discs. Movies are this machine's speciality. The 17.3-inch display doesn't have the Full HD resolution of the Acer Aspire Ethos 8934G and HP Envy 17 3D, but it matches the Samsung RF710-S03UK for sharpness. Images are bright and vibrant and films look great as a result. Dedicated speakers from audio specialist Bang & Olufsen take up a sizeable chunk of space above the keyboard. 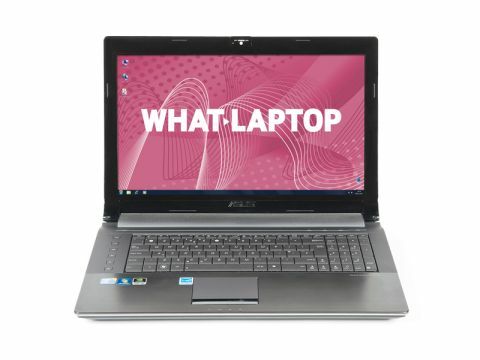 Although volume levels and sound quality are good for a laptop, we were a little disappointed when compared to other laptops here and the Acer's speakers have more power. As with the HP Envy 17 3D, an Intel Core i5 processor has been used, although the Asus has just 4096MB of memory. We found performance lacking – enough to capably multi-task with various applications, but not enough to offer much future-proofing. Graphical power is also slightly lacking. The dedicated Nvidia GT 420M GPU can run the latest games, with support for DirectX 11, but you'll have to turn down detail levels for a smooth frame rate. Nvidia's Optimus technology allows a basic integrated graphics chip to take control when dedicated graphics aren't required. This is supposed to save battery power, but appears to have very little effect here. This laptop also has limited storage for a laptop of this size, although the 640GB hard drive is still enough for a huge media collection. USB 3.0 is available for speedy data transfer with external storage devices, which we've found is roughly twice as fast as USB 2.0. There's also a feature dubbed ExpressGate, which boots the laptop into a basic operating system in seconds for browsing the web or photos. We found the keyboard was slightly more cramped than the others and we prefer the isolation-style design used elsewhere, although it's still comfortable to type on. The touchpad is a reasonable size and smooth to use.